Watch the recipe video on our Facebook page. 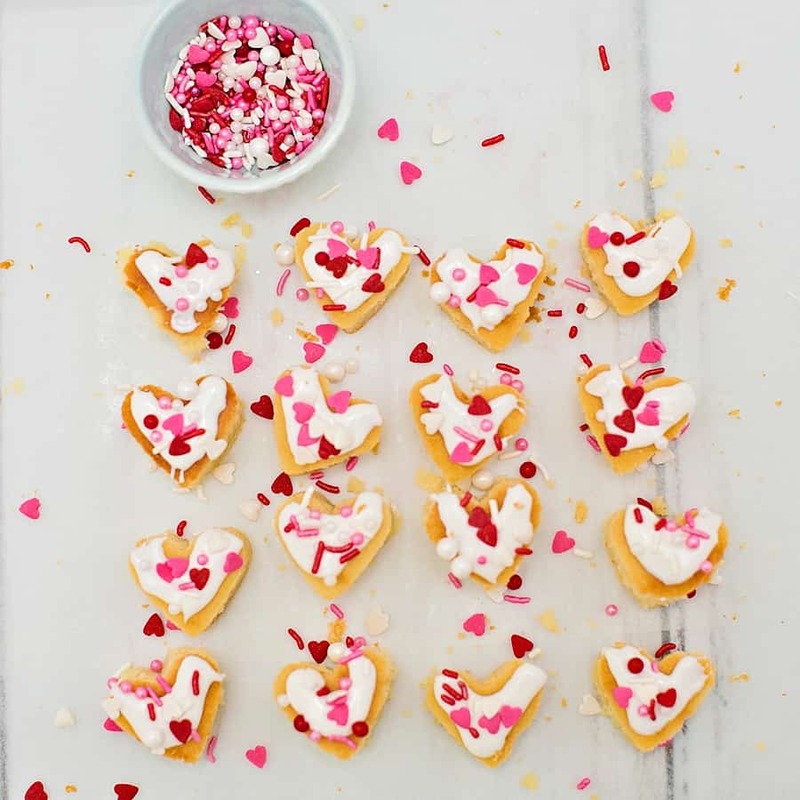 A while back we stumbled upon the genius that is sheet pan pancakes and made some sheet pan banana blueberry pancakes on our craft site, hello, Wonderful, as well as Valentine Sheet Pan Pancake Hearts. 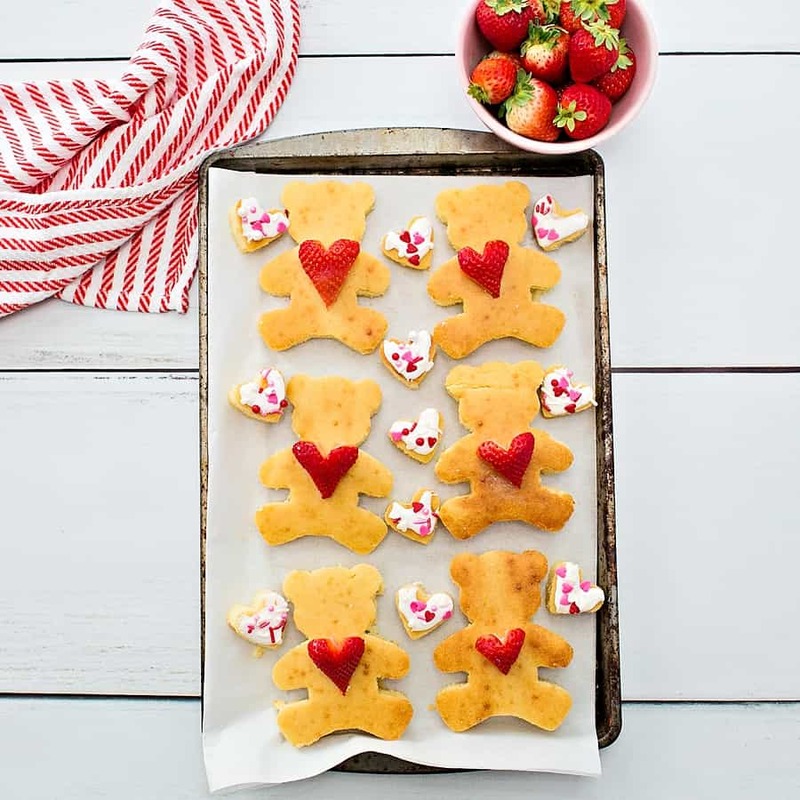 You already know we’re big fans of cute teddy bears holding heart foods so we combined our love of easy sheet pan pancakes with adorable bears and made these irresistible Sheet Pan Bear Heart Pancakes! 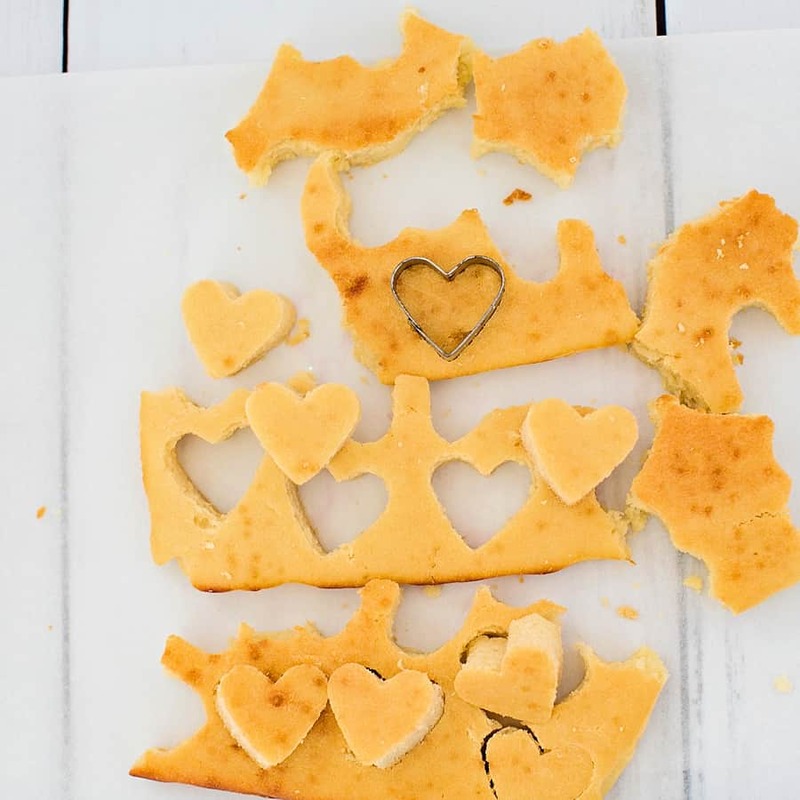 What we love about sheet pan pancakes is that they feed a bunch of people, so whether you have a large family or need to make something for the class, church or brunch party, they are a perfect breakfast item to bring. 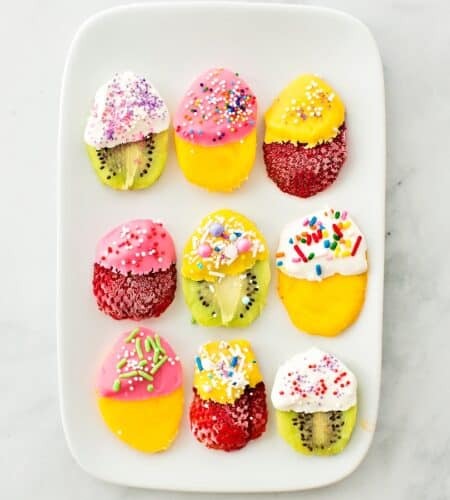 Another thing to love is that you can virtually make any type of sheet pan pancakes you want, add your favorite fruit or nuts or mix-ins. Use your favorite homemade pancake batter or simply use a mix, no one will notice the difference, I promise. 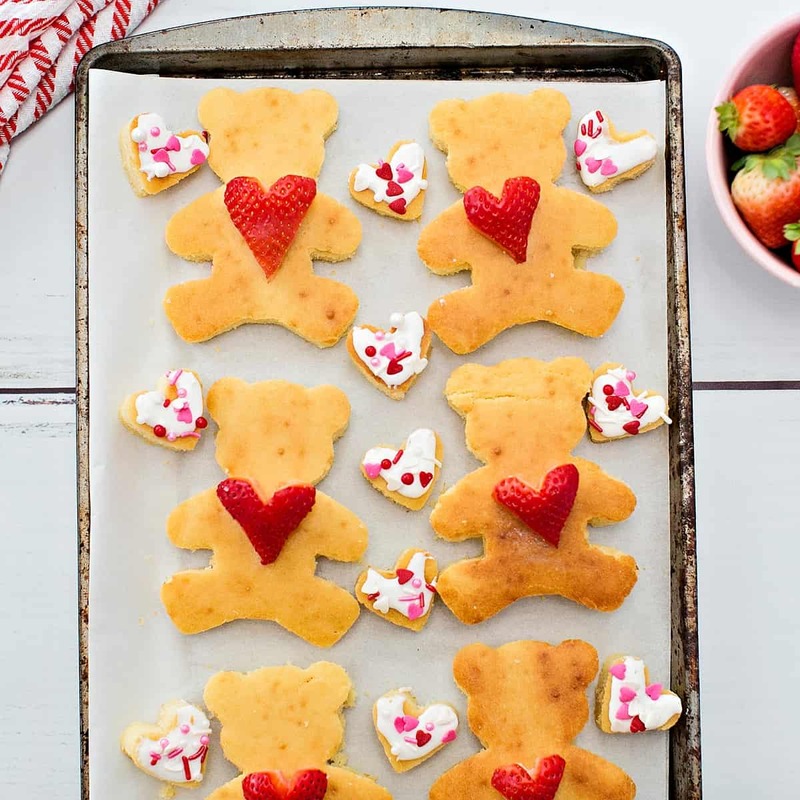 We also love using sheet pan pancakes as cookie dough! 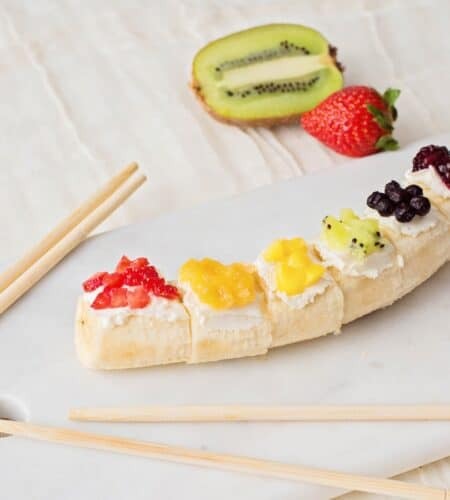 It’s like an already rolled out cookie dough based ready to be cut and served! 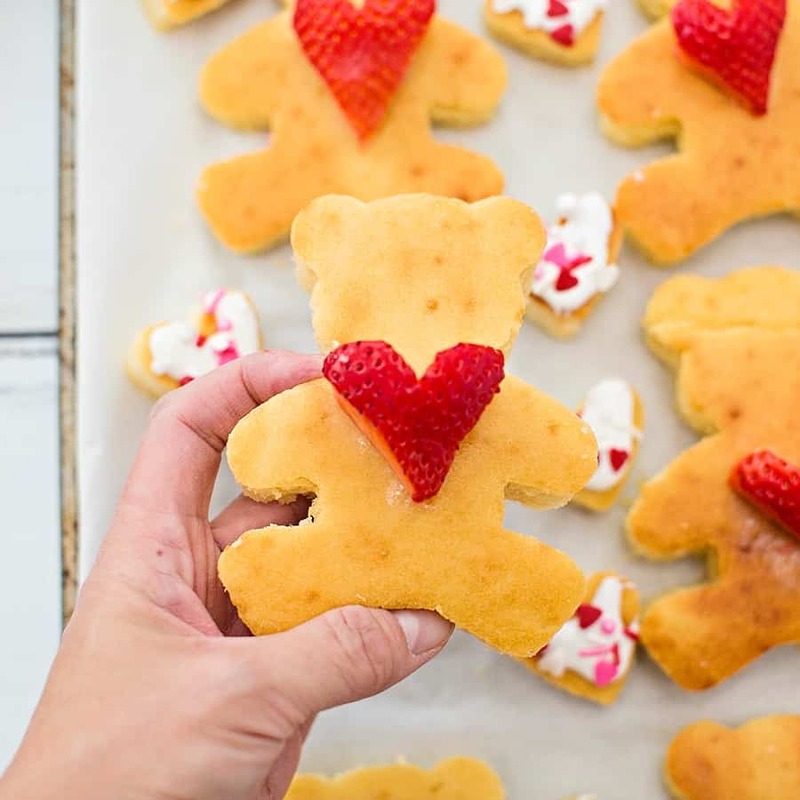 We used these adorable bear cookie cutters for our Valentine pancakes and simply added a cut-out strawberry heart. 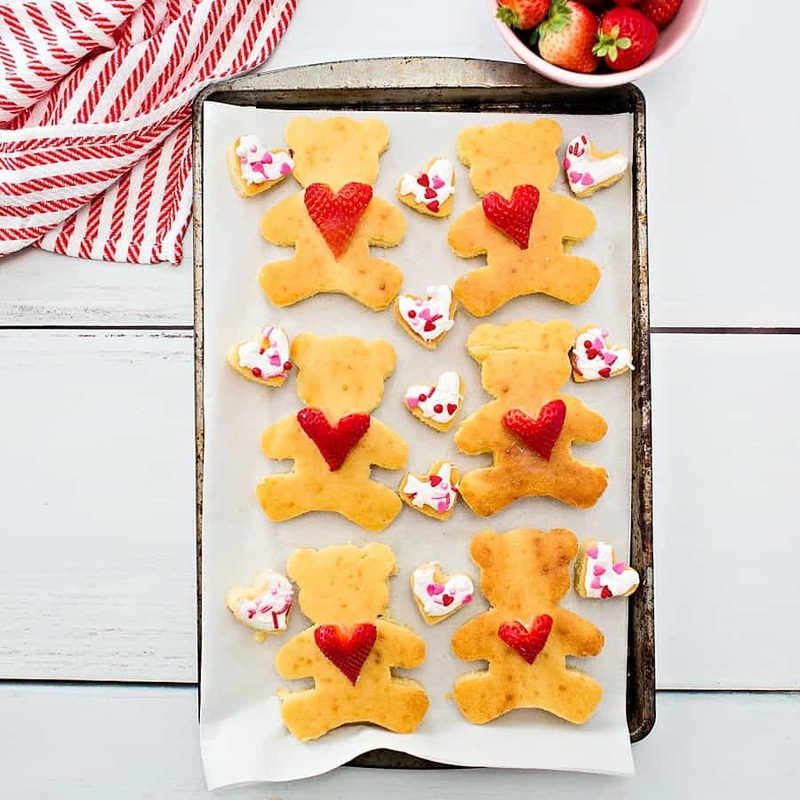 Not one to waste any food (especially with kids in the house) use up the leftover pancake scraps to make mini heart cookies! 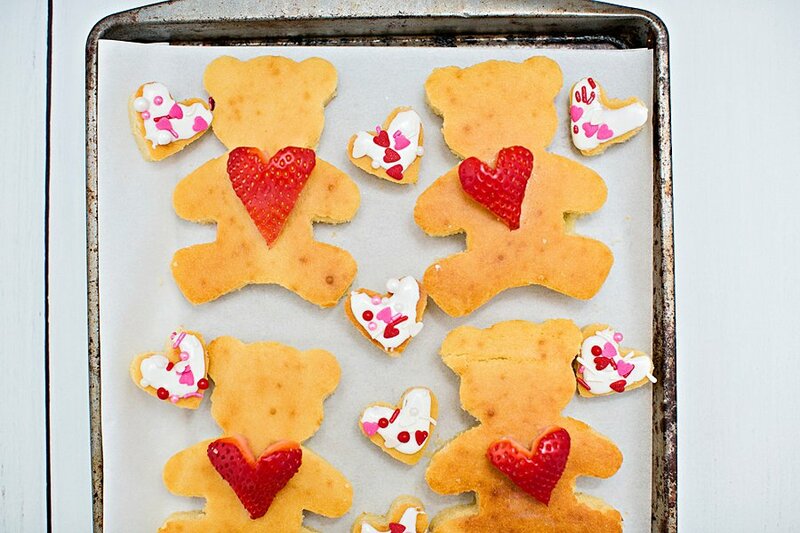 You can use ready-made store bought icing and add a dash of Valentine sprinkles on top, like we did. 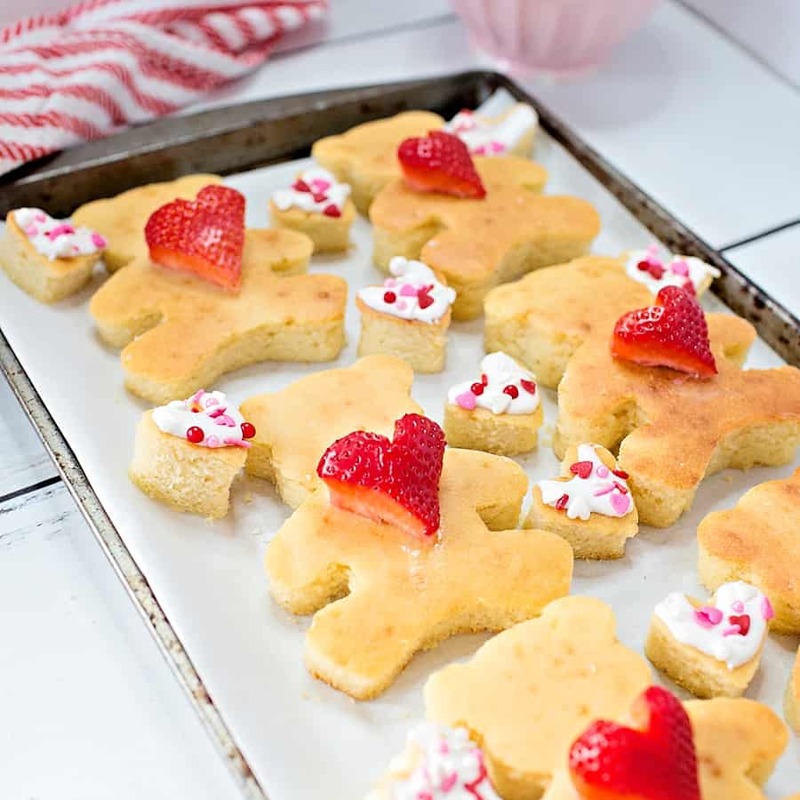 Or you can easily use a mix of milk and powdered sugar for a quick icing and glaze. 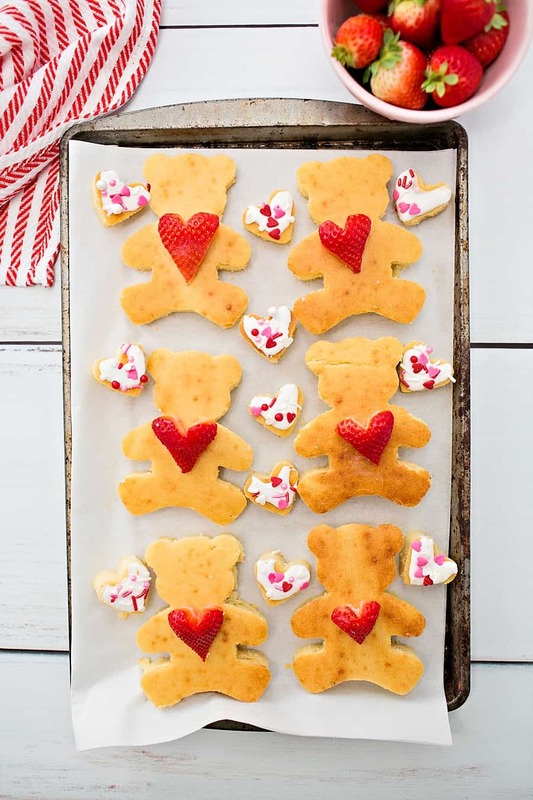 For this recipe you will need a bear cookie cutter (ours was around 4.6″ inches tall), a mini heart cookie cutter (1″), and Valentine sprinkles. 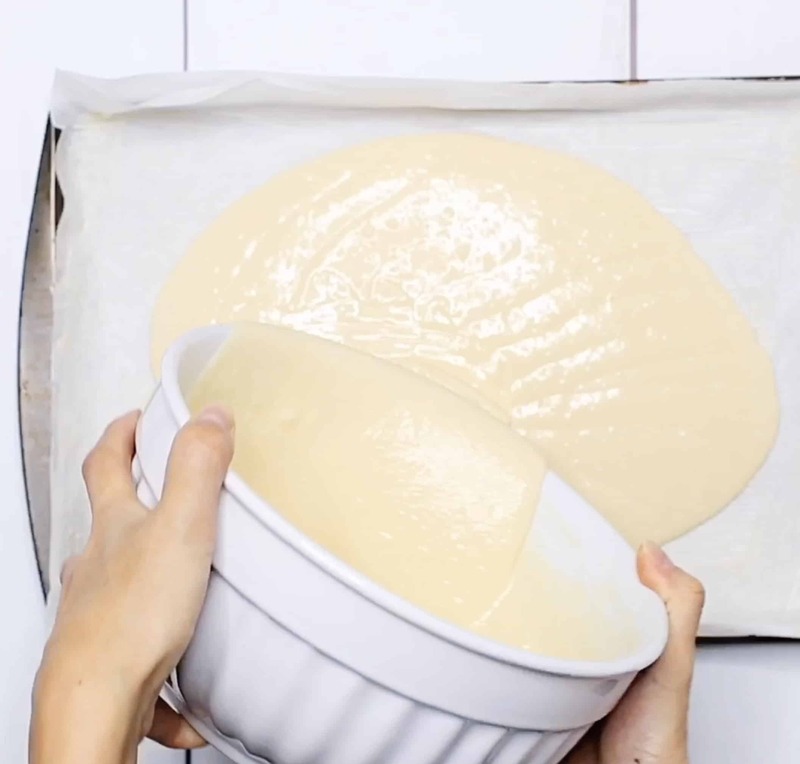 You will also need parchment paper and a 18″ x 13″ rimmed baking pan. 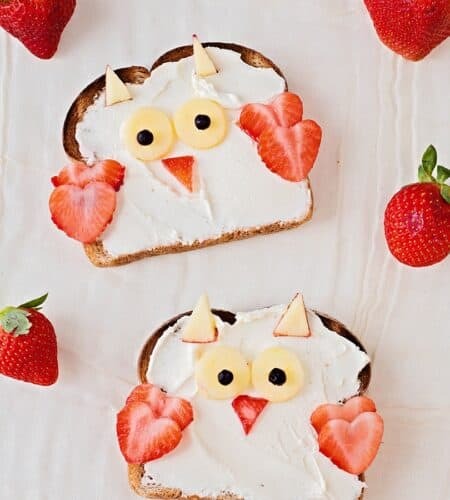 This makes a wonderful Valentine’s Day breakfast to surprise the kids on this love-filled day! 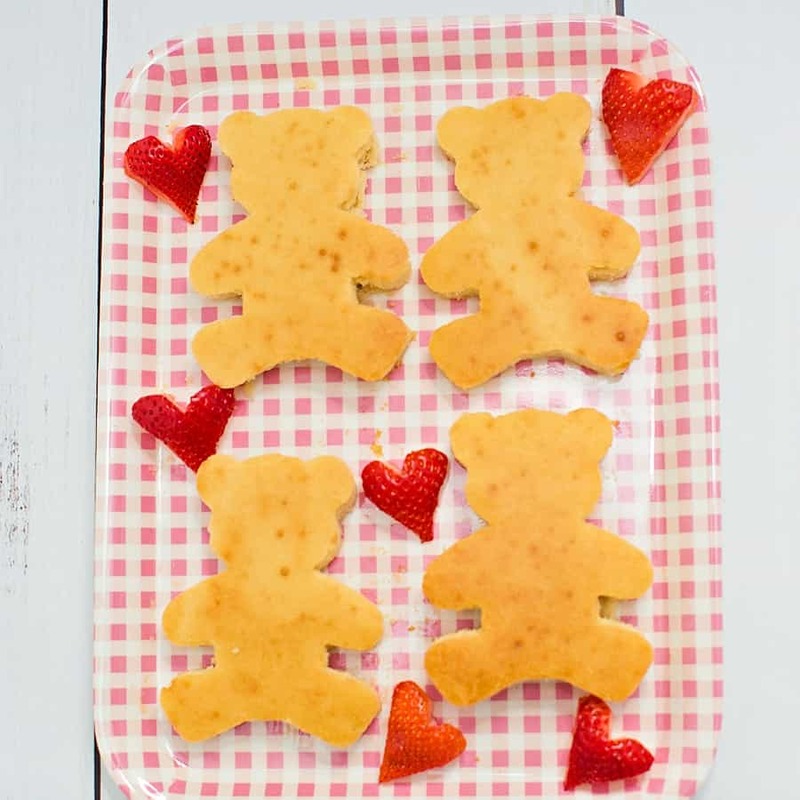 With a drizzle of maple syrup, and the heart pancake cookies, we consider these dessert in the house. 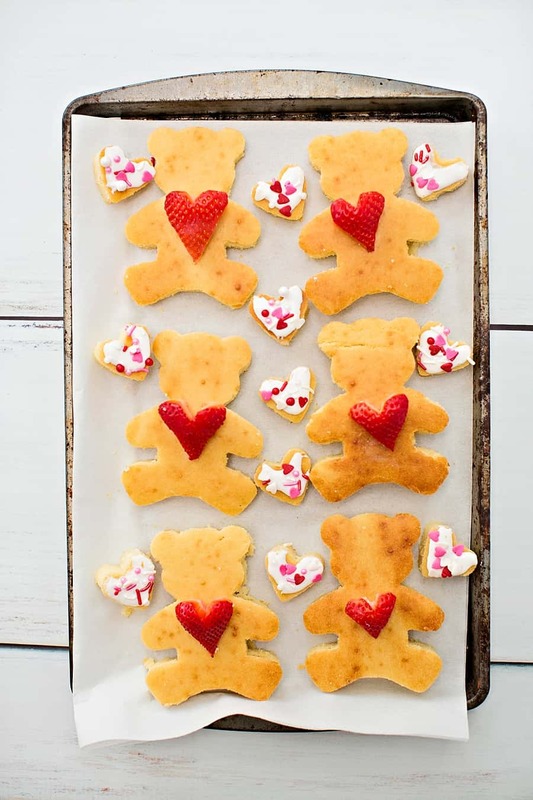 Definitely lower sugar than your typical cookies! 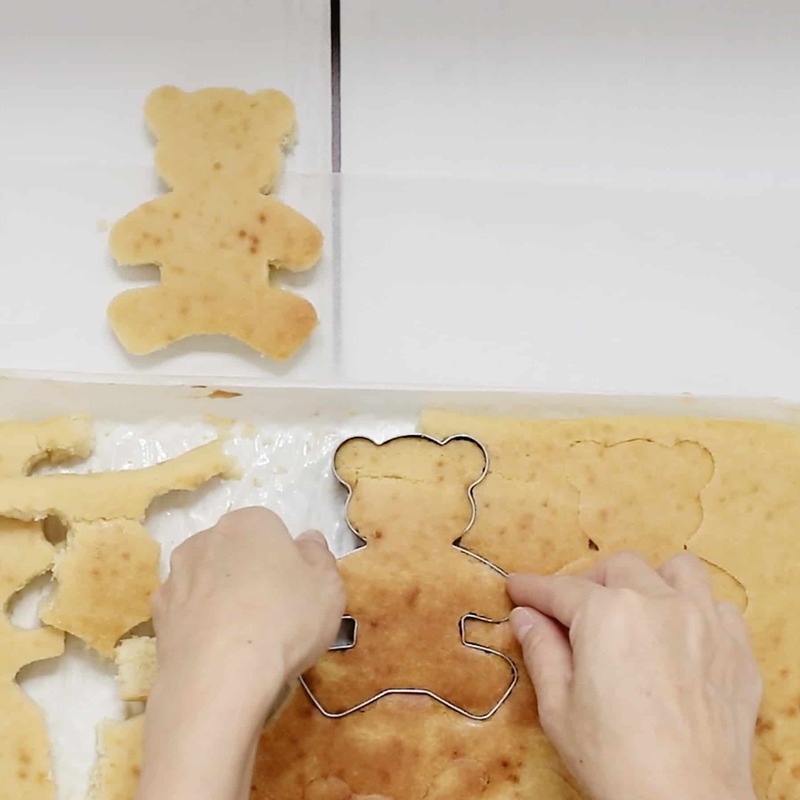 Watch the step by step video on how to make these adorable Sheet Pan Bear Pancakes on our Facebook page HERE. 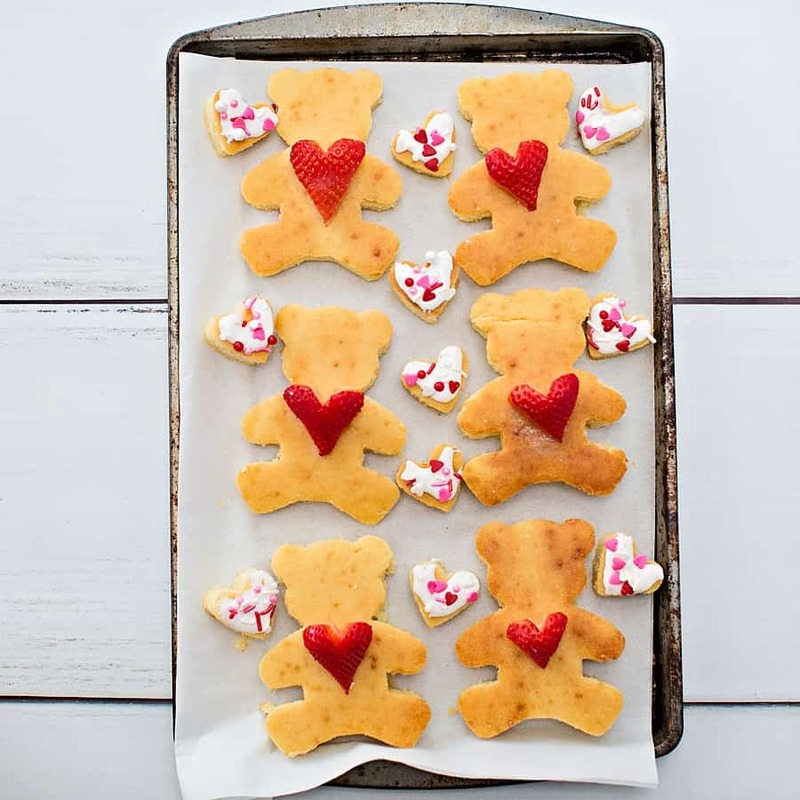 Make these adorable Sheet Pan Bear Heart Pancakes for a cute Valentine breakfast or any occasion! Step 1. Preheat your oven to 400 degrees. Step 2. 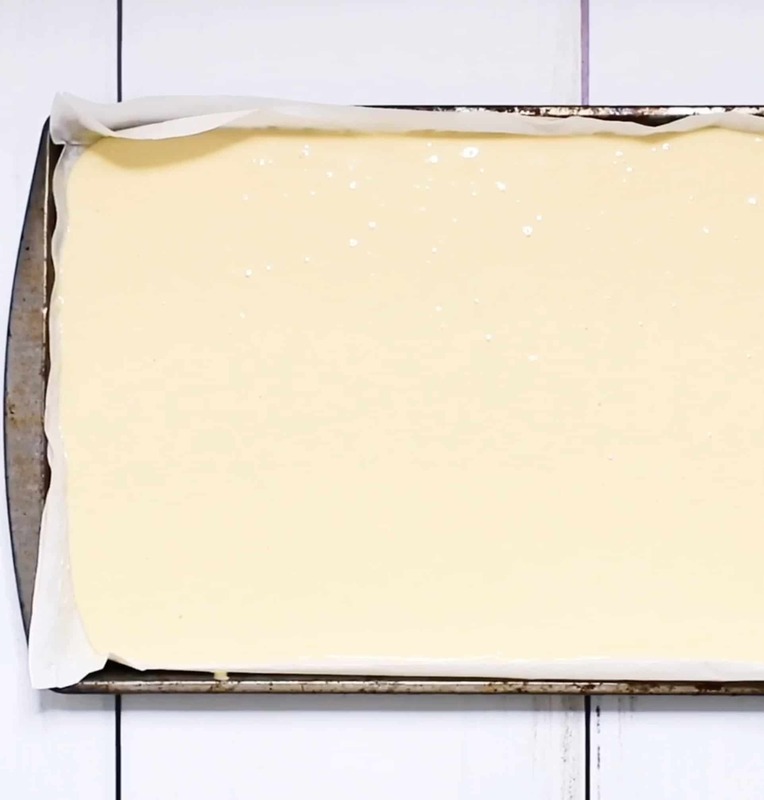 Line an 18" x 13" baking pan with parchment paper and brush with 2 tbsp of melted butter. Step 3. Whisk the flour, sugar, baking powder, and salt in one bowl. Step 4. In another microwave safe bowl, add your milk, remaining 8 tbsp of butter, and microwave just until the butter has melted. Microwave 20-30 seconds at a time, stir to melt the butter and continue in the microwave for added time if necessary. Step 5. Mix your eggs with the milk and butter mixture until incorporated. Step 6. Pour your egg/milk/butter mixture in the bowl with the flour, stir until just mixed, do not overmix. Step 7. 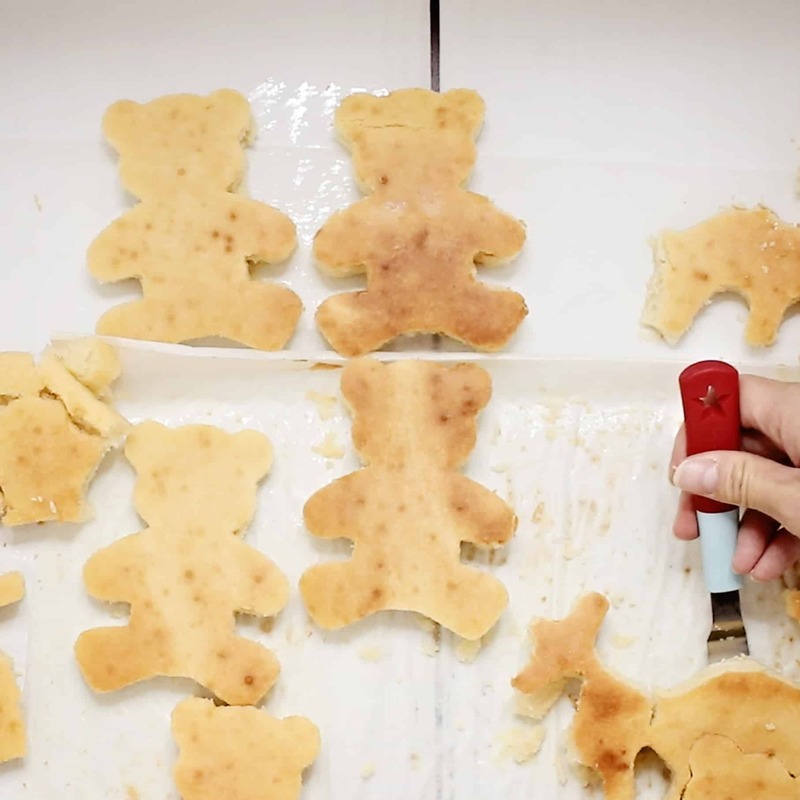 Pour pancaker batter evenly over your baking sheet. Smooth evenly with a spatula. Give it a light pound against your countertop to get out any air bubbles. Step 8. Bake for a total of 20 minutes in a preheated 400 degree oven. Rotate in between time. At 20 minutes, the pancake will look very pale but it will be done (check by lightly touching the tops, if it springs back it is done). To give it some color on top, set your oven to broil and rotate the pan a couple of minutes. Make sure to watch it so the top does not burn. Step 9. remove the pan from the oven, allow to cool until you can remove the sheet pan from the parchment. Step 10. Ue your bear cookie cutter to cut out shapes. Our is large, about 4.6" tall so it make about 6. 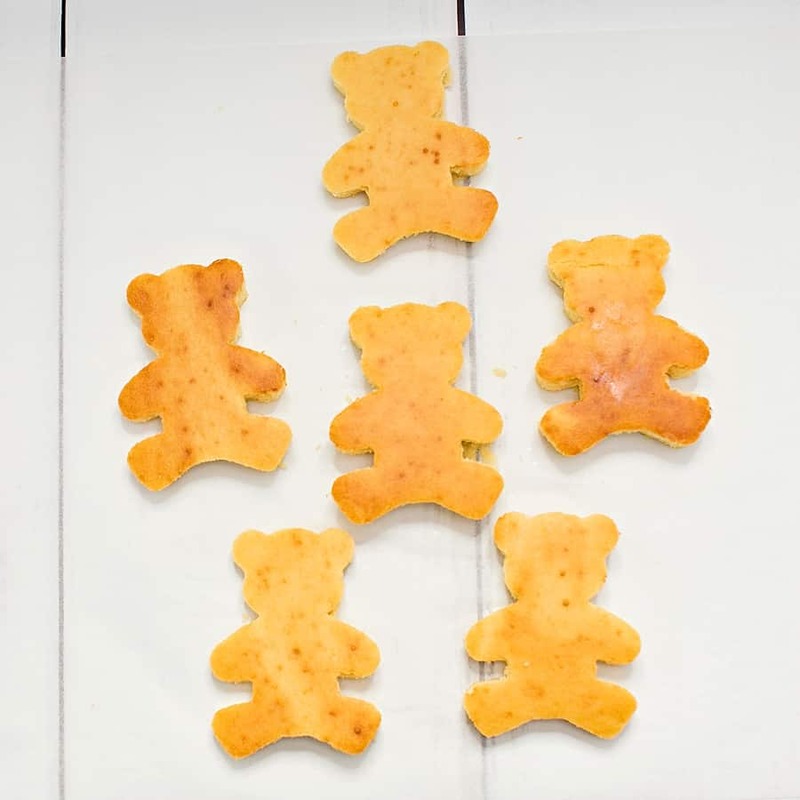 You can make more bears with smaller cutters. Step 11. 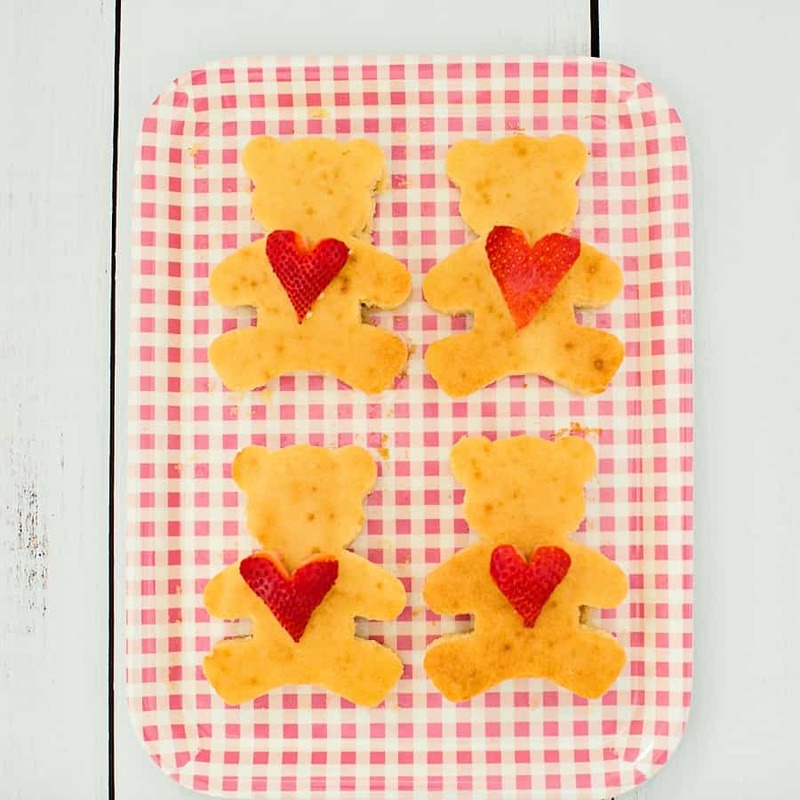 With your leftover scraps, cut out mini heart shapes with a small 1" heart cookie cutter. Ice with frosting (we used store-bought) and add sprinkles on top.